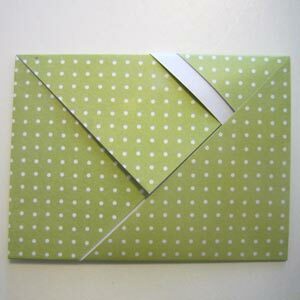 Learn how to make an envelope from a sheet of paper. It's really easy! Why would I want to make one when I can just buy one? Because normal envelopes are boring and handmade ones are awesome. 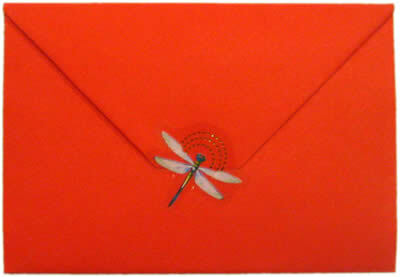 When you make your own envelope, you can you can make it in whatever color or pattern you want. 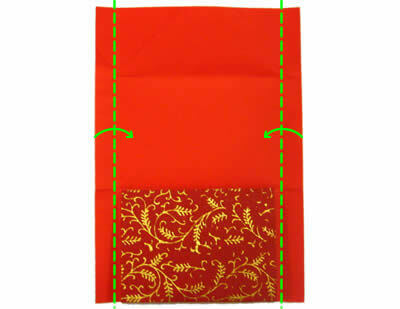 You could use Christmas paper to make a Christmas-patterned one for a Christmas card, for instance. Well, maybe you've run out of envelopes and just don't feel like going to the store. 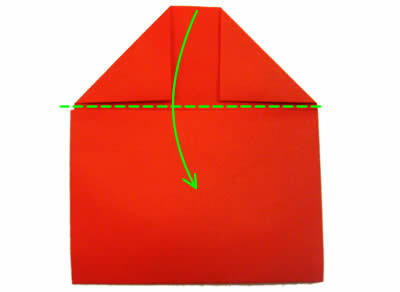 Anyway, stop asking questions and let's get on learning how to fold an envelope shall we? Can I post an envelope like this in the mail? I can't guarantee anything, but I've posted these in the mail several times and they've always arrived at their destination. I've got a greeting card (left) and I'm going to make an envelope for it from a sheet of paper (right). 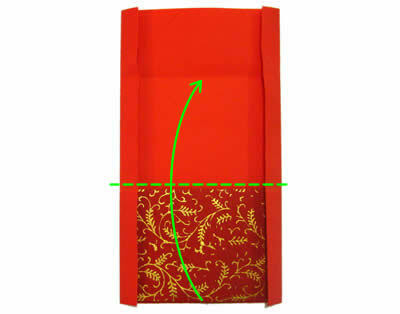 The sheet of paper should be slightly wider than the card, and about 2.5 times as tall. 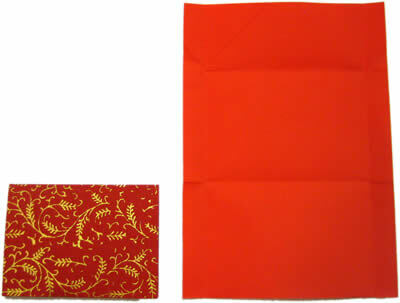 I'm using plain red paper here, but you can use scrapbooking paper or wrapping paper to make really colorful envelopes. Place the card at the bottom-center of the sheet of paper, then fold in the sides of the paper so that they cover the edges of the card. 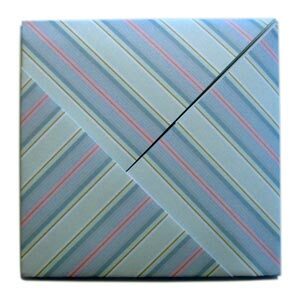 Fold up the paper (with the card still inside it) along the top edge of the card. 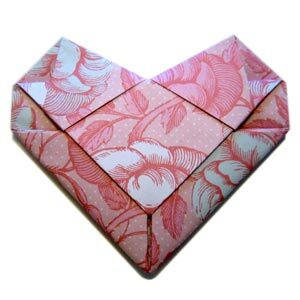 Fold down the two top corners. 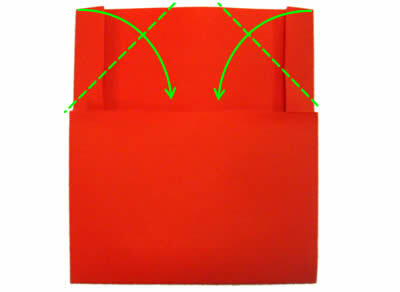 Make it so that they almost reach down to the edge of the bit you folded up in the last step, but not quite. Fold down the top flap to close. Use glue or a sticker to hold the flap down. If you're going to post your envelope in the mail, then it's worth gluing or taping the sides shut too just to make really sure that your card is extra secure. Here's what it looks like from the front side. 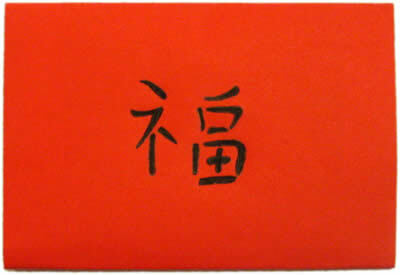 I've drawn on the Chinese symbol for good luck! How did your envelope turn out? I hope you found my instructions clear. If you have any comments or questions or just want to say high, you can contact me with this handy form . While you're here and in the mood, take a peek at these related pages!